Horses are a more popular artistic subject than dogs - that's one of 10 illuminating facts unearthed by BBC analysis of Art UK's digital archive, which catalogues more than 200,000 of the nation's oil paintings. 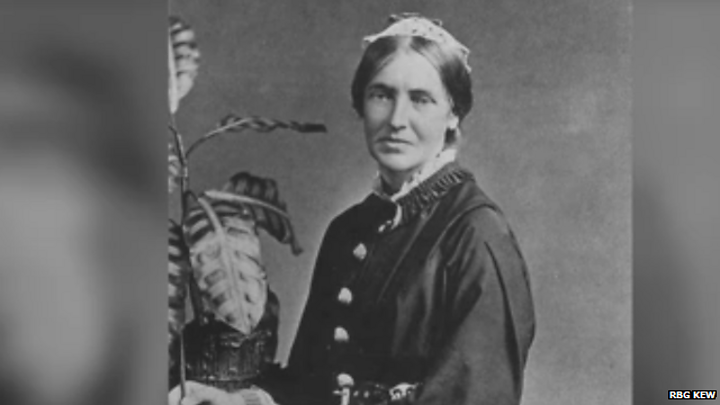 The woman with the most paintings in the collection is the Victorian botanist Marianne North. Born in 1830, North devoted her life to travelling the world and painting plants. There is a gallery at Kew Gardens in south-west London dedicated to her work. North had no formal training, according to the Kew website. However, she put her natural talent to "prolific" use on her travels. During an eight-month stay in Brazil, she finished more than 100 paintings. Instead of painting individual plants, her work typically showed landscapes and natural habitats. The Marianne North Gallery contains 833 paintings by the artist, showing more than 900 species of plant. North approached Kew and offered to build the gallery in return for her life's work being displayed in it. It opened in 1882. The Stuart king's execution in 1649 enshrined his status as an object of fascination for artists. There are more than 200 paintings of Charles in the collection, about 40 more than his son, Charles II, who was restored to the monarchy in 1660. Andrew Ellis, director of Art UK, said: "It does not surprise me that Charles I is the monarch with the most portraits. "Not only was he the greatest of royal patrons and collectors of art but he was also keenly interested in how art could promote the image of kingship. Some of the portraits date from after his death including one in King's Lynn Town Hall, which was the subject of a sonnet written for Art UK by the poet John Fuller." Maritime trade, sailing and naval power have long captured the imagination of artists. We counted up the words used to describe the paintings in the collection. Boat (12th), sailing (14th), mast (16th), ship (17th), wave (18th), sea (22nd), sail (25th) and rigging (42nd) all feature in the top 50. Pieter van der Merwe, the general editor of the National Maritime Museum, said the emergence of the seascape as an art form in England was imported from the Netherlands in the 17th Century. 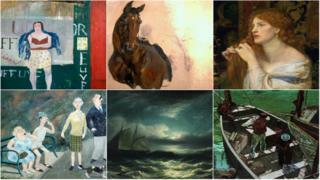 "It's a British taste, but where did we get the taste for maritime art? We did not invent it ourselves, we got it from the Dutch," he said. We may be a nation of dog lovers, but there are more horses than dogs in the collection, according to the list of the most popular tags. The horse is the most popular animal tag (49th), followed by dog (132nd), bird (138th), cow (140th), sheep (172nd) and fish (200th). Pictured is the Scottish painter George Harvey's depiction of a horse from 1836. John Everett's 1,058 oil paintings form the largest collection by a male artist. Dorchester-born Everett, a well-connected Edwardian, was a graduate of the Slade School of Fine Art who lived his life according to his dual passions - painting and sailing. His life and work remained relatively unknown until art historian Gwen Yarker began researching his biography. The majority of his art lies in the storerooms of the National Maritime Museum in Greenwich, while his landscapes can be viewed at Dorset County Museum. Ms Yarker said Everett shunned fame, was ambivalent about exhibiting and reluctant to take the limelight. "Art history has not been kind to him," she said. Works of art can be handed over instead of inheritance tax. Under the scheme, the government accepts the item at market value, and hands it over to a public museum or gallery. Andrew Ellis said: "We are aware that we are still missing key information for many of the paintings on the site. Who is the artist? Who is the sitter? Where is the landscape? "The Art Detective sub-site of Art UK is helping to fill in some of this missing information with the incredible help of the general public." BBC News examined the dates of the paintings in the collection. The median year was 1910, meaning half of the paintings we have a creation date for came before that date, and half afterwards. However, we could only ascertain dates for about half of the 214,000 artworks. Some 74,000 paintings had no year at all, and another 27,000 used either date ranges or other descriptions. Earlier works are less likely to be dated as record-keeping was poor. Andrew Ellis said: "At the other end of the scale, some 50% of the collections on the site have fewer than 10 paintings." Art UK's roots go back to 2002, when a charity, the Public Catalogue Foundation, was founded by Fred Hohler, who was determined to improve the public's access to the art it owned. The record started life as a series of hardback colour catalogues on a county-by-county basis. In 2011, the BBC and Public Catalogue Foundation launched the Your Paintings website to catalogue the collection online. Five years later, this became Art UK. The website was built with funding from Arts Council England, the Scottish government and a private foundation. The data analysed relates to the artwork in Art UK's digital archive.